New Delhi: People in Uttar Pradesh complain the most about the implementation of the National Rural Employment Guarantee Act (NREGA) to the Centre. Madhya Pradesh and Rajasthan take the next two spots, according to data revealed by the ministry of rural development in an answer to a parliamentary question. NREGA is one of the flagship welfare programmes of the Congress-led United Progressive Alliance government. While 337 complaints have been received by the ministry from Uttar Pradesh since the implementation of the scheme in 2005, 158 have been received from Madhya Pradesh and 138 from Rajasthan, the home state of C.P. Joshi, the minister in charge of the programme. Only one complaint has been received from Left-ruled Kerala, the least for any state. A total of 1,010 complaints have been received so far at the central level by the ministry. The complaints mainly relate to delayed wage payments, corruption, non-issuance of job cards and the use of funds for non-permissible activities. “Though one can’t say that more complaints always mean poor implementation, these numbers could be a reflection of faulty implementation," said a ministry official in charge of the scheme who did not wish to be identified. In terms of the number of complaints relating specifically to misappropriation/misuse of funds received by the ministry in 2008 and in the current year, the trend is similar. While Uttar Pradesh tops the list yet again with 100 of the total 242 complaints (from 19 states), 37 and 25 complaints were received from Madhya Pradesh and Rajasthan, respectively. Some officials say the higher number of complaints from a state could also be reflective of weaker redressal mechanisms at the district and state levels. “Sometimes, when the grievances redressal mechanisms are effective at the block, district or state level, then fewer complaints need to be made at the central level," the official said. “For instance, only 12 complaints have been received from Andhra (Pradesh) where there is wide implementation of the scheme because the complaint cells there are effective," he said, adding that these were just the complaints received by the ministry and there were several more made at other levels. The complaints are usually referred to the respective state governments which are expected to take appropriate action. However, in the case of “serious complaints", the ministry initiates an inquiry through national level monitors. Some officials say that more complaints from a state don’t have to indicate a negative trend. “Although a larger number of complaints in a state would prima facie imply less satisfactory implementation, it may not necessarily be so. It could also indicate wider coverage, more alert civil society organizations, alert citizens, etc," said Arvind Mayaram, additional secretary and financial advisor, ministry of rural development. According to him, if a state has a greater number of projects under NREGA, it is more likely to throw up a greater number of complaints compared with a state where the implementation is on a smaller scale. For instance, Uttar Pradesh and Madhya Pradesh have over 500,000 projects under the programme, while Rajasthan has 169,224. However, Kerala has taken up merely around 43,000 projects. Given this disparity, Uttar Pradesh, Madhya Pradesh and Rajasthan are more likely to have a larger number of grievances in the implementation of the scheme. The ministry received 103 complaints from Bihar, which has taken up around 120,000 projects so far. 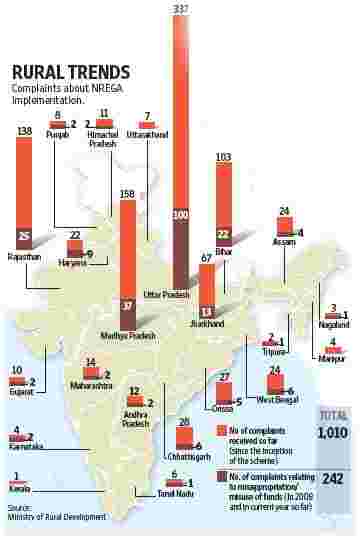 On the other hand, despite prolific implementation, some states have very few complaints. The ministry has received only 12 overall complaints from Andhra Pradesh and only two relating to the misuse of funds—one of the lowest—despite the number of works taken up being as high as 7,37,395. Similarly, Gujarat and Karnataka have recorded only 10 and four complaints, respectively, despite taking up over 250,000 projects—more than Rajasthan and around half that of Uttar Pradesh and Madhya Pradesh.